Welcome to our press corner. 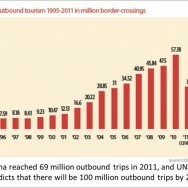 Here we provide you with regular updates and press releases regarding China Travel Trends & the booklet. If you need further information, materials, images or other creative content from us, please get in touch with us at jens@chinatraveltrends.com. Understanding the potential of China’s outbound tourism made easy by authoritative new publication which is also available as a free e-book download. 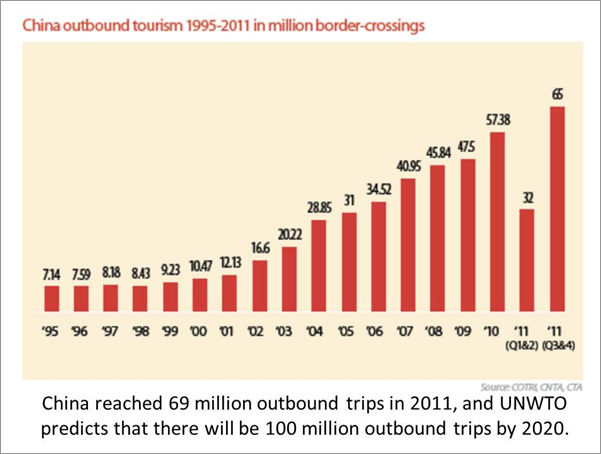 BEIJING, 7 May 2012 – A new travel industry book will make it easier for businesses to understand China’s consumers, particularly their travel preferences and the latest social, economic and digital trends in a highly complex, fast-moving market. The “Essential China Travel Trends Guide – 2012 Year of the Dragon Edition,” published by ChinaTravelTrends.com and produced in collaboration with Dragon Trail Interactive (www.dragontrail.com), COTRI (www.china-outbound.com), and the Pacific Asia Travel Association (www.pata.org), includes articles on Outbound Tourism, Luxury Travel, Tour Operation, Chinese Consumers, Customer Satisfaction, Internet and Social Media, Mobile Marketing, Hotel Regulation, Hotel Profitability, MiCE, Green Tourism, Aviation, Human Resources, and Emerging Cities. The publication was produced by Dragon Trail Interactive (www.dragontrail.com) in collaboration with COTRI (www.china-outbound.com) and the Pacific Asia Travel Association (www.pata.org). Its authors include experts from the China National Tourism Administration (CNTA), China Tourism Academy, Dragon Trail, China Outbound Tourism Research Institute, PATA China, Horwath HTL, Jones Lang LaSalle, UBM Aviation, GreenEarth.travel, Vari Arts Travel, TUI China, World Travel Monitor, Hurun Report, and Portfolio. 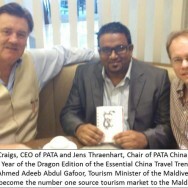 “The guide is designed to de-mistify some of the trends and issues international travel companies face when entering the Chinese market and looking to attract Chinese consumers”, said Jens Thraenhart, publisher of China Travel Trends, co-founder of Dragon Trail, and Chair of PATA China and the PATA Technology Innovation Council. The 2012 Dragon Edition follows on from the acclaimed first edition of the “Essential China Travel Trends Guide – 2010 Year of the Tiger Edition”. The 2012 edition is endorsed by top level authorities such as CNTA, UNWTO, WTTC, PATA, IATA, IH-RA, DMAI, HSMAI, ATME, HFTP, IFITT, ETC, AH&LA, MTCO, ATTA, and ICTP. Tony Tyler, CEO of the International Air Transport Association (IATA) writes in the book that by 2015, one out of every seven journeys by air will be related to China. 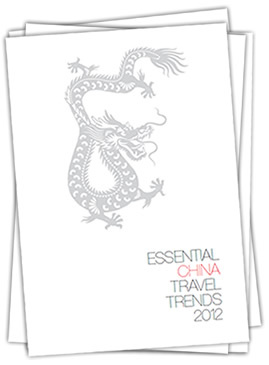 The “Essential China Travel Trends – Dragon Edition” e-book is available for exclusive download at www.ChinaTravelTrendsBook.com, and the print book will be available for sale via the PATA e-Store starting June 1, at a price of Euro 25, as well as tourism events worldwide. Part of the profit supports the “Save the Panda” initiative, and readers are encouraged to donate via the book website. 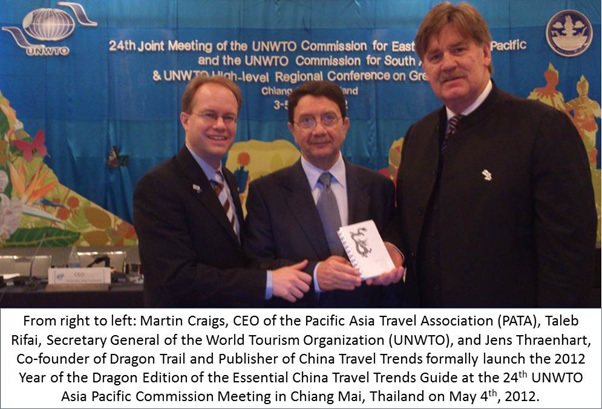 The new book was formally launched at the at the 24th Joint Meeting of the UNWTO Commission for Asia Pacific in Chiang Mai, Thailand on 4 May, which was attended by senior tourism officials and ministers from 19 Asian countries, who received an exclusive print pre-view copy. 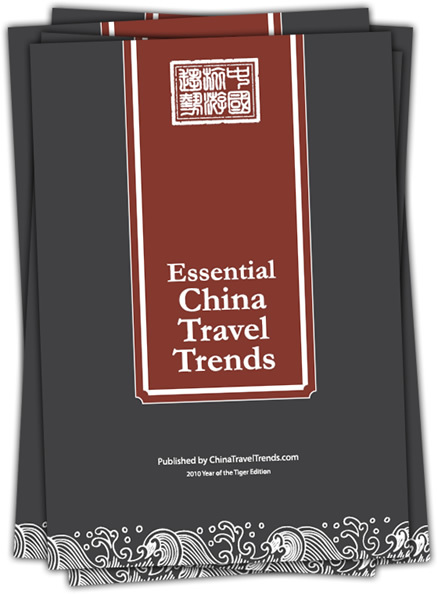 For more information about the “Essential China Travel Trends Guide – 2012 Dragon Edition”, and for free e-book download, please visit www.ChinaTravelTrendsBook.com. The first edition of the guide to “Essential China Travel Trends”, published in the year of the Tiger, by ChinaTravelTrends.com, and produced in collaboration between Dragon Trail and VariArts Travel Group, with support from GreenEarth.travel is an attempt to reveal some of the critical trends, and pitfalls when trying to enter this market, and offers insights from practitioners in the industry, including Professor Wolfgang Arlt of COTRI, Damien Little of Horwath HTL, Xiaoan Wei of the China Tourism Academy, Rupert Hoogewerf of the Hurun Report and the China Rich List, Charlie Li of China Southern Airlines, and Daniel Tschudy of HQC Group, Geoffrey Lipman of Greenearth.travel, Lin Xu of the China Luxury Travel Network, and Jens Thraenhart and George Cao of Dragon Trail. It includes topics such as Internet and Social Media, Distribution, Sustainability, Outbound and Domestic Tourism, MICE, as well as Hotel Development. 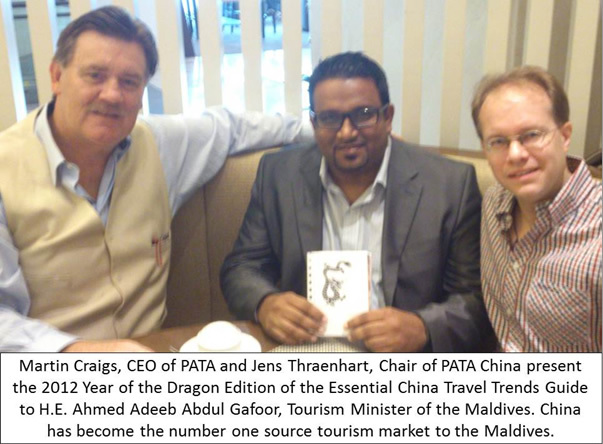 The book features introductions by Taleb Rifai, Secretary General of the World Tourism Organization (UNWTO), Jean-Claude Baumgarten, CEO of the World Travel Tourism Council (WTTC), and Hiran Cooray, Chairman of the Pacific Asia Travel Association (PATA). The Tiger Edition of the Guide to “Essential Travel Trends” supports the “Save China’s Tiger Initiative” and offers insights from industry practitioners active in the Chinese travel market, and is available at select industry conferences. Interested conferences and organizations may contact us to discuss partnership opportunities. 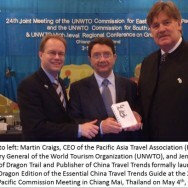 Coinciding with the 10th Global Travel & Tourism Summit by the World Travel and Tourism Council Summit (WTTC) in Beijing on May 25-27, 2010, the Year of the Tiger edition of the Guide to Essential Travel Trends was launched, which was the first publication in its form about the Chinese Travel Market. Dragon Trail is the leading travel technology and digital marketing company, by leveraging the complex Chinese online and social media landscape to develop and seed relevant content, executing results-driven digital marketing campaigns, and enabling innovative technology solutions to help travel and tourism organizations to reach and connect with affluent and sophisticated Chinese consumers. Based in Beijing and Shanghai, and founded by Chinese and global e-tourism experts, Dragon Trail has executed award-winning Mandarin language websites and performance-based Chinese social media campaigns for tourist boards and hotel companies from all over the world. In collaboration with COTRI (China Outbound Tourism Research Institute), the partnership offers an integrated “China Solution”, including technology, marketing, trade sales, and research, as well as service training, combined with specific industry expertise and local knowledge. Together, both Dragon Trail and COTRI co-publish the resource website and community ChinaTravelTrends.com. 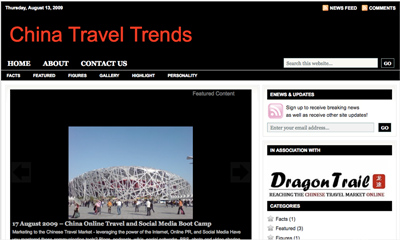 Dragon Trail launches ChinaTravelTrends.com – a unique English language Resource website about marketing travel and tourism to Chinese travelers. At the first China Travel Social Media Forum at Beijing’s Hotel G Boutique Hotel, an audience of professionals from major hotel companies and national tourism organizations witnessed the launch of ChinaTravelTrends.com (Twitter: @cnTravelTrends). According to the website’s Publisher and Chief Editor Jens Thraenhart: “Education is crucial in a time when China is growing in importance for travel companies, and many of the trends are more complex to understand than those in North America and Europe. The website’s aim is to aggregate information from various sources, interview experts in the industry, conduct research surveys, and publish its own articles and analysis.” As part of the seminar, attendees had the opportunity to get a sneak preview of the “China Travel Marketing Survey”, trying to understand how international hotel companies and tourist boards market to Chinese consumers by leveraging social media and digital marketing.